In this blog post, we will discuss the Kerala State Heat Map by District Excel template. This is a free Excel template that you can use to create heat maps instantly. You will learn how you can enter your own data in the template to create heat maps. You will also learn the features and options available within the template to customize and extend. 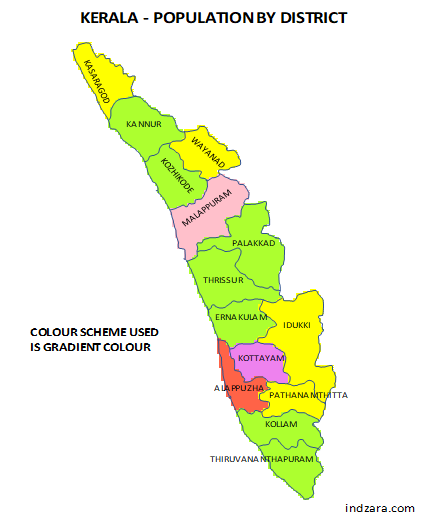 Here we will be creating a geographical heat map where the area we will be coloring is a geographic division (by district) of the state of Kerela. Each district can have a different color based on the data value for that specific district. For example, we can visualize the population distribution by district, literacy rate by district, or any numeric data we have at the district level. There are other types of use cases too, which we will discuss later. There are currently 14 districts in Kerela (as of March 2018). The names in English are sometimes different depending on which source you choose. We have used Wikipedia – List of Districts as the source for the names of districts in English. Kasaragod, Kannur, Wayanad, Kozhikode,Malappuram, Palakkad, Thrissur, Ernakulam, Idukki Kottayam, Alappuzha, Pathanamthitta, Kollam, Thiruvananthapuram. Disclaimer: We have done our best to create the map outlines as accurately as we can. However, doing it in Excel has its limitations. The map is just for illustrations and is not expected to be 100% accurate with respect to the exact size and outlines of district and state. Choose which color scheme to use. In the table above, we are setting the districts with data values from 1 to less than 10,00,000 to be Red. From 10,00,000 to less than 15,00,000 to be Brown and so on. Any district with value from 40,00,000 will be colored in Gold. You can change colors by selecting from the drop down. The 10 color choices available are Red, Green, Blue, Yellow, Pink, Violet, Brown, Gold, Orange & Gray. (In a separate post, I will explain how to change or add colors). Any district with value less than the first value will use the gradient color scheme by default. In our examples here, we started with 1. So, any negative value will use the gradient color scheme. But you are not limited to only positive values. Here is how you can also use negative values in the data ranges. After changing the settings, you should be able to view the updated map instantly. If the calculations do not refresh, please press ‘Calculate Sheet’ in Formulas Ribbon or press Shift+F9. The map will look busy with this option, especially since we have large numbers. However, you can convert the numbers to be shorter in length and that would make it more readable. You can also change the font size, which we will cover later in a separate post. Now that we know how the heat map will look, let’s talk about printing.. In addition to creating heat maps, this template can be used for other purposes too. In the next article, we will discuss some of those special use cases of this template. If you find the template useful, please share this post with your friends. If you have any feedback or suggestions, please post in comments section below. We are in the process of publishes the templates for all Indian states, would soon release the same for Karnataka.